James Oran Egger, son of Ben Noel Egger and Ruby Hazel Jeffrey, married to Gloria Jean Ensminger and buried in Slater Chapel Cemetery, Nolan, Nolan County, Texas. Lawn Independent School District Vocational Agriculture Teacher (1954-1957). First Jim Ned Consolidated Independent School District Vocational Agriculture Teacher (1957-1987) and Jim Ned CISD/Buffalo Gap Campus Principal (1987-1997). James Oran Egger, 81, passed from this life on Friday, April 12, 2013 to be with his Lord, family and friends. A funeral service is scheduled for 2:00pm Sunday, April 14th, 2013 at the Lawn Baptist Church with Price Mathieson and Kenneth Jordan officiating, directed by Fry~Bartlett Funeral Home. A visitation was held Saturday evening, April 13th, 2013 at the funeral home. Oran was born in Brownwood, on December 25, 1931 to Ben and Ruby (Jeffery) Egger. Before the age of one he and his family moved to the Nolan Community where his family operated a dairy and beef cattle stock farm. 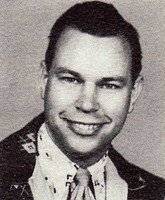 He graduated from Divide High School in 1951. He married his high school sweetheart and lifelong love of 58 years, Gloria Jean Ensminger on May 25, 1951 at Nolan. Oran continued his education becoming a Texas Tech Red Raider receiving his BS Degree of Education in 1954 and a Master's degree in 1959. Upon graduating in 1954, Oran applied at only one school for his Vocational Agricultural teaching job, which was at Lawn ISD. He taught at Lawn for three years until consolidation with Tuscola in 1957. He became the Jim Ned Vocational AG teacher for the next thirty years, then became the elementary principal at the Jim Ned Buffalo Gap Campus for the following 10 years. During his teaching career, he taught his son, daughter, daughter-in-law, and two of his four grandchildren, along with hundreds of other students in the Jim Ned District. Oran was an active member of the Lawn Baptist church for 58 years; serving as a deacon for 50 years, and a Sunday school teacher for many of those years. Oran enjoyed traveling with his family, friends, and especially his grandchildren. Oran and Gloria enjoyed pulling their camper all over the United States. Of course he enjoyed anything that was outdoors including fishing, farming, and ranching. He was always happiest when Gloria was right alongside. Oran was preceded in death by his wife Gloria (2010), and his parents. He is survived by his son Stan Egger and wife Nan of Tuscola, daughter Ora Jean Lee and husband Jimmie of Seymour, brother R.B. Egger of Atlanta, Georgia, sister Glenda Davis of Gallup, New Mexico, grandchildren, Cole Egger of Dallas, Jessica Baldwin and husband Scott of Dallas, Jill Stewart and husband Cody of Saint Jo, and Jacie Lee Abney of Lewisville. He is also survived by two great grandchildren, Paylin Grace Stewart and Croix Alexander Baldwin. Pallbearers for Oran are the Deacons of Lawn Baptist Church, J.W. Allmand, Clay Shott, Randy Doan, Doug Jones, Rodney Davis, Keith Whitehurst, Jerry Adams, Randal Brown, Ricky Walker, Joel Terry, and Steve Stogsdill. Honorary pallbearers are, Amos Aldridge, Leo Dennis, Lee Hamilton, and Bill Thornton. In lieu of flowers, memorials may be made to First State Bank in Tuscola, designating either to Lawn Baptist Church or the Oran Egger Agricultural Scholarship Fund for Jim Ned Students.